The Bulls’ hopes of having a player in the 2014 NBA All-Star Game took a bit of a hit in the latest NBA fan voting returns released Thursday. It’s now looking as if center Joakim Noah may have the best chance among the Bulls players as he held onto seventh among Eastern Conference frontcourt players. Deng, who was ninth among frontcourt players in the first balloting released Dec. 12, fell to 11th. Carlos Boozer remained 12th. Three frontcourt players and two backcourt players are selected by the fans for the Feb. 16 game in New Orleans. Fan voting concludes Jan. 20 with the results announced on the TNT show Jan. 23. 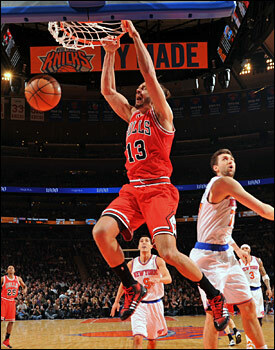 If the Bulls’ record improves, it would likely give Noah a better chance of reaching the All-Star Game. Noah is averaging 10.6 points and 9.8 rebounds. The coaches select the reserves, which are revealed a week later. The coaches are not bound by the fan voting totals. But they generally stay close to those results. The commissioner replaces injured players. The vote totals for Deng, who is the Bulls leading scorer at a career best 19.6 per game, may have been affected by his injuries. He’s now missed a quarter of the Bulls games this season. If he remains out much longer with his Achilles problem, it may further limit his chances with the coaches, with whom Deng is a favorite for his all around play and team first game. The coaches also tend to favor players from successful teams, which will prove creative in the Eastern Conference this season with only Indiana, Miami and Atlanta having winning records. The Bulls are 11-16 and ninth in the Eastern Conference. So there’s a good chance the coaches will go strongly with players from those winning teams, making Roy Hibbert, Al Horford, David West and perhaps Paul Millsap and Kyle Korver, the latter working on an alltime record shooting streak, possible additions. If the coaches believe they want to add another big man, Noah could have a chance given he has been healthy and has played well lately. Plus, Nets center Brook Lopez went out for the season. Other center candidates, like Tyson Chandler, Andrew Bynum, Spencer Hawes and Nikola Vucevic, play for teams with poor records. If the Bulls’ record improves, it would likely give Noah a better chance. Noah is averaging 10.6 points and 9.8 rebounds. Boozer is averaging 14.9 points and nine rebounds. In the Eastern Conference, LeBron James, Paul George and Carmelo Anthony seem certain to be named starters along with Dwyane Wade and Kyrie Irving. Even though he hasn’t played all season, Derrick Rose remains third in the balloting. He would not be on the team even if he were to move up to second in voting because of injury. The guard depth is particularly weak in the East this season with Rajon Rondo, also still out all season, sixth in the voting behind Rose, John Wall and Ray Allen. Thus, there’s a good chance the coaches opt for an extra front court player, which would bode well for players like Noah, Deng and Boozer. After the starters in the fan voting in the frontcourt, Noah trails just Hibbert, Bosh and Kevin Garnett. Andre Drummond and Chandler moved ahead of Deng in frontcourt from the last results in the fan voting. In the Western Conference, there continues to be a wild race with Kevin Durant, Dwight Howard and Blake Griffin leading in the frontcourt with Kevin Love still barely behind Griffin. In the backcourt, Kobe Bryant even though out again with injury, remains a runaway leader. As Bryant said he’ll return within six weeks, he’ll likely start in the All-Star game unless he is hurt again. Chris Paul is second among guards. But you could make a case for at least five other Western Conference guards as All Stars, including Stephen Curry, who is third and could overtake Paul, James Harden, Russell Westbrook, Tony Parker and Damian Lillard. At least one and perhaps two will have to be left off. That doesn’t even include other Western Conference guards having excellent seasons, among them Monta Ellis, Ty Lawson, Mike Conley and Eric Bledsoe. There’ll perhaps be an extra backcourt player in the Western Conference with the frontcourt not as deep. LaMarcus Aldridge likely will be added by the coaches with Portland having the best record in the conference. Other frontcourt players who could be added include Dirk Nowitzki, Tim Duncan, Serge Ibaka, Anthony Davis, David Lee, Zach Randolph and Chandler Parsons. The Western Conference currently has nine teams with winning records to three in the East and a 75 percent winning mark against Eastern teams.